The most recent complete count of the District's population, the 2010 decennial Census, reported 20,245 African-American males between the ages of 20 and 29. Assuming that number did not change significantly in the two years since, then one in every 723 Black men in this age bracket was the victim of homicide in 2012. If this year's murder rate holds constant, one out of every 72 Black male twenty year-olds will be murdered before their cohort reaches the age of 30. And one out of every 38 will be violently killed before the age of 40. To put DC's murder rate in perspective, consider Chicago's 500 homicides in 2012, a statistic that has shocked the nation. 163 of these victims were Black men in their twenties, a demographic totaling 56,726. That means that one out of every 348 Black males between the ages of 20 and 29 was murdered this year. That is appalling. The survival rate of young Black men in DC in 2012 was double the rate in Chicago. But to rejoice in that fact is akin to the Sacramento Kings celebrating that they have ten wins compared to the Wizards' four. Until we can reduce the homicide rate to a point where the murder of a single 21 year-old Black man shocks the city, addressing violent crime and, more importantly, its roots, should be a top priority of the District. Thanks to Homicide Watch DC for the valuable work they do. Please check out the site if you have not, and consider supporting them. *Note: Officially, the race of four of these victims is unknown, but it is almost certain they were African-American. Why? Because 91% of the homicide victims for which the race is known were Black, the ethnicity of the four Asian and Hispanic victims were identifiable by their surnames, and the murder of a white person in the District does not go unscrutinized. Where Could a Small Grocery Store Thrive in Ward 8? The Yes! Organic Market in DC's Fairlawn neighborhood has struggled to survive, and Anacostia's only grocery store recently closed. Why can't grocery stores thrive here? Mainly, economics. But one spot could work. There are many factors that determine the success of a retail enterprise, including marketing, accessibility, visibility, competition, demographics, and location. Yes! Organic may have been difficult to access for westbound drivers, and it could certainly have benefited from an improved outreach campaign, but the fundamental challenge for the store is that it is located in an area with low aggregate income, a result of relatively low household incomes and the presence of relatively few households. Much of the area around Fairlawn's Yes! is undeveloped (Anacostia Park and River, Fort Dupont Park, etc. ), and the developed blocks are low- to medium-density. 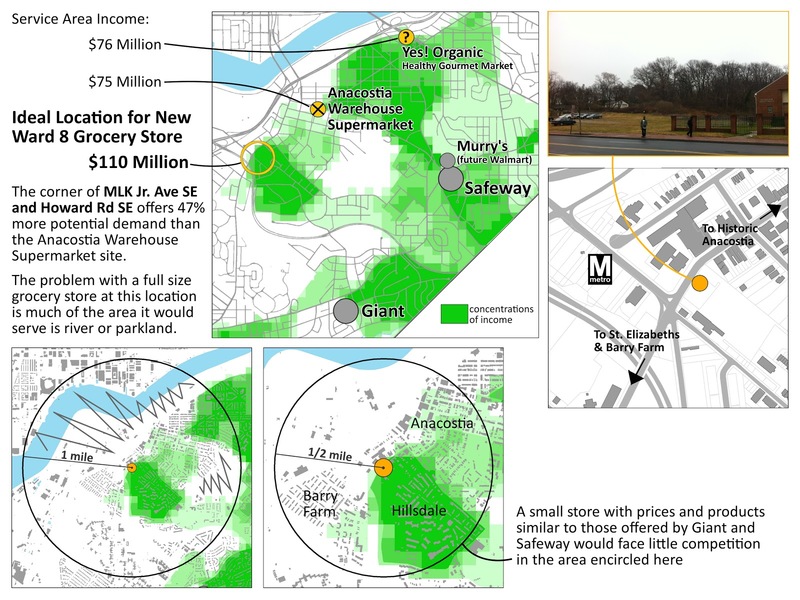 The graphic above helps illustrate how the purchasing power the store's service area compares with those of other grocery outlets in the city. The Anacostia Warehouse Supermarket closed its doors because the former owner sold the property. The buyer is optimistic about the site's potential, but in a presentation to the Historic Anacostia Block Association in February of this year, he all but ruled out the possibility of bringing in another grocery store. He said that the potential grocery tenants he spoke with were deterred by the presumed arrival of Walmart at Skyland, just up the street. Does the eventual presence of two full-service grocery stores at the top of the hill mean that Ward 8's flatland neighborhoods will be forever without their own market? 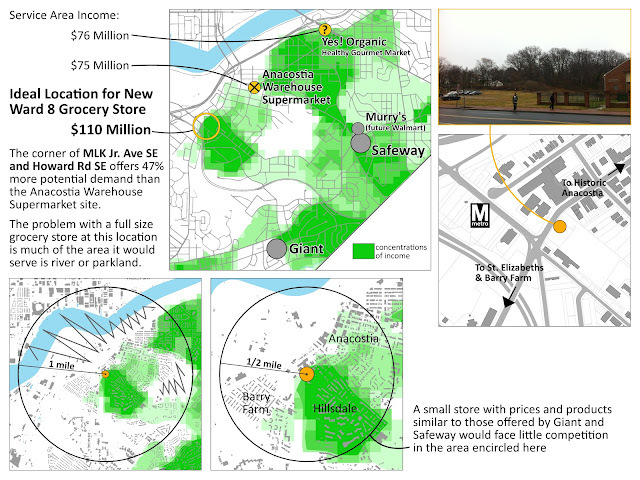 If there is a location best suited for a store to fill the gap, it is at the intersection of Martin Luther King Jr. Ave SE and Howard Rd SE, immediately adjacent to the Anacostia Metrorail station and Metrobus hub, and the meeting point for the Anacostia, Hillsdale, and Barry Farm neighborhoods. The ideal, and most feasible, site for new development at this intersection is the vast lot owned by Bethlehem Baptist Church, currently used as parking. It is not uncommon for churches, often major landowners, to develop the land they own for a purpose consistent with their mission. Matthews Memorial Baptist Church, two blocks from Bethlehem, recently oversaw the development of a new affordable housing complex on one of their parcels. Across town, at 10th and G Streets NW, the First Congregational United Church of Christ was part of a redevelopment team that delivered a new facility for the church on the ground floors of an office building. By developing their vacant land as housing, office space, or a community or spiritual facility, with ground floor retail including a grocery store to replace the shuttered Anacostia Warehouse Supermarket, Bethlehem Baptist Church, and its pastor Reverend James E. Coates, DC's inaugural Ward 8 councilmember, could cement a legacy in the District while doing a huge service to their neighbors in the heart of Ward 8. Click here for grocery store location data. Please add any stores I missed. The District of Columbia is an expensive city, so any increase in the cost of living is likely to get people riled up. And it's hard to argue against the protests of those who work for minimum wage, are unemployed, or simply earn modest salaries as teachers, trash collectors, or security guards. A $100 parking ticket can feel crippling to a low income family. 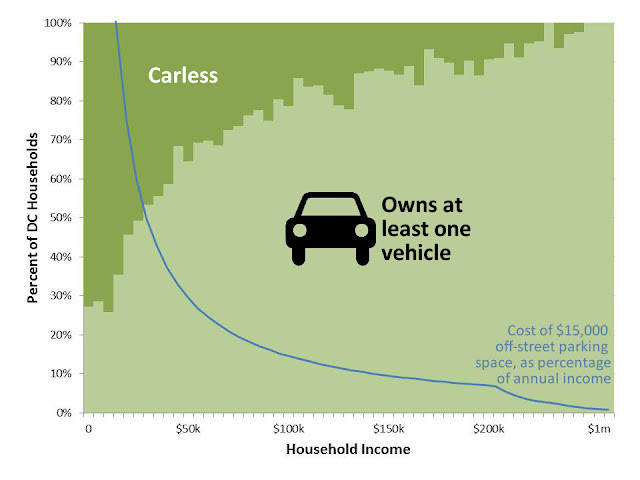 Although car ownership rises with income, lots of poor families own and drive cars too. A household with two full time minimum wage workers earns slightly less than $35,000 per year. According to data from the American Community Survey's most recent 5 year estimates, the probability that a DC household with a $35,000 annual income owns a car is slightly higher than 50%. The likelihood that a household earning $50,000 has a car is about 64%. Which brings us to the debate over whether DC is doing right in reducing the subsidies that have traditionally been given to drivers, for example in the form of free or artificially cheap parking. The problem with charging a flat fee on a certain behavior, like parking, speeding, or plastic bagging your groceries, is that the poorer you are, the more you pay as a percentage of your total income. Behavior taxes are highly regressive, but usually accepted by progressives because there is a cheap alternative of equal quality (e.g. canvas grocery bags in lieu of plastic ones). Is there a high quality alternative to driving? It depends on your travel patterns. If you live near a metro station, work or study near a metro station, and only visit friends who also live near metro stations, then WMATA offers a service equal or superior to car ownership. But if you live far from metro (keep in mind that housing near transit is more expensive), put your kid in a charter school across town because the neighborhood school is crappy, shop at the cheapest store rather than the closest, and visit family in places like Bowie on the weekends, then Washington's public transit system is not an efficient option. While I feel for the low and moderate income families who have become car dependent, I've also drunk the Smart Growth Kool-Aid. Our society must change its driving habits, urgently. We have to drive less and drive shorter distances, and regulations and policies at all levels must facilitate this transition. For the sake of the environment and for the fiscal well being of the country, which wastes too much money on sprawling infrastructure and the militaristic pursuit of foreign oil. 1. Stop subsidizing parking and driving. Charge as much as people will pay for on-street parking, using performance parking. Eliminate minimum parking requirements for new developments, require developers and retailers to unbundle parking costs from all other goods and services, and toll the roads. Then use a portion of that revenue to send every poor family in the city a big check. Send middle income families a medium sized check. If driving is an indispensable part of their lives, then they can use this check to pay for the new tolls, parking fees, or expensive speeding tickets. If they can reduce their driving or get rid of their car completely (perhaps they were among the many who didn't drive in the first place), then they will have a big or medium sized check (or, more realistically, a refundable tax credit) to spend on anything else their hearts desire. 2. Make alternate modes of transportation so unbelievably attractive that everyone will want to use them. Make public transportation cheap for the user. Not just cheap in terms of fare, but also time. Have you ever ridden a bus in DC? Not only do they have to deal with the stop signs, stop lights and congestion just like cars, but they also stop just about every block to pick up and drop off passengers, and then merge back into traffic. So let's give buses their own lanes, free from cars. If public opinion insists on streetcars instead of buses, then give the streetcars their own lanes. Let people pay before they board so it doesn't take a decade just to load. There are entire websites dedicated to how Metrorail can improve its service, so I won't go into detail on that topic, but like any other form of public transit, it must be faster and more reliable. 3. Pay low income families to live near metro stations, because housing near transit costs more. DC offers low income renters vouchers (though the number is very limited), property tax abatements, and down payment assistance. Households that live within a half mile of a Metrorail station should have these benefits increased by 50% (or some other less arbitrary, evidence based percentage). The Smart Growth movement will continue to be seen as arrogant and elitist if its main policy proposals involve regressive taxes and fees. To counteract this perception and broaden their base, anti-sprawl enthusiasts must also advocate for social and economic justice and reject the overly-simplistic assumption that the poor are entirely transit dependent. Who’s Commuting to DC's East of the River Neighborhoods? WMATA's latest data release confirmed what we already knew: most Metrorail riders take the train from the suburbs into DC. But relatively few ride to the District neighborhoods east of the Anacostia River. Where are they coming from and going to? About 75% of total trips in the AM peak terminate at one of the 42 stations in or immediately adjacent to the District (within 500 feet). Only 2% of these riders, or 1.5% of all trips, get off at one of the 7 stations in or bordering the portion of the District east of the Anacostia River. Of the more than 3500 riders who make up the numerator of this statistic, 40% get off at Anacostia and 20% at Minnesota Ave, affectionately known as the downtowns of their respective wards (8 and 7). The reason nearly 5 times as many people take the train to Farragut North as to all East of the River stations combined is obvious: Land use. 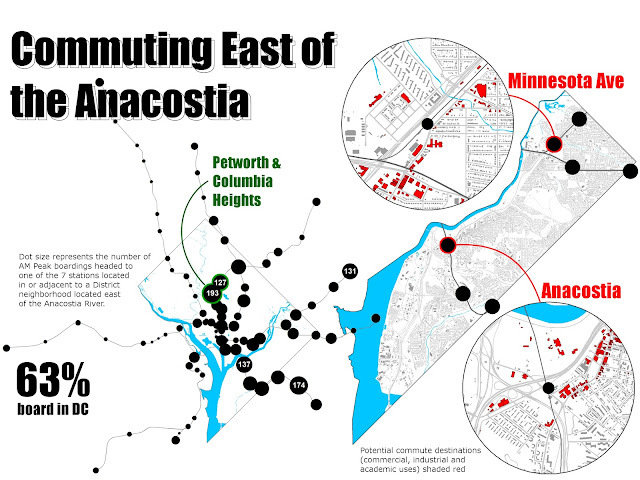 The Anacostia and Minnesota Ave station areas offer fairly similar non-residential uses, which include a limited number of destinations one would commute to on a weekday morning. Both have a few schools nearby, one relatively new District government office building, a smattering of small retail stores and restaurants, mostly carryout, and a number of light industrial sites. 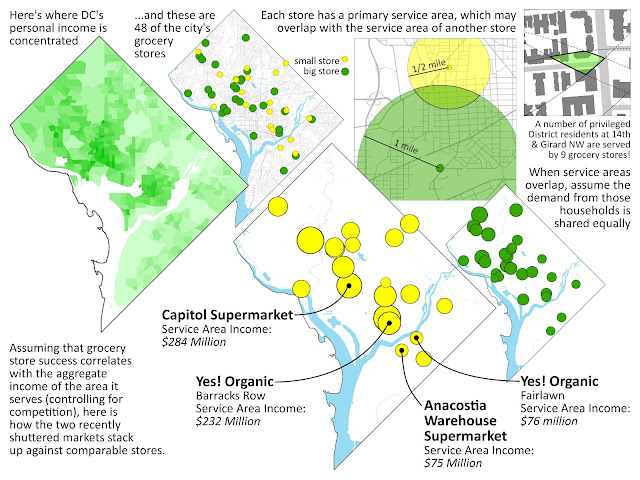 Anacostia has a couple additional office or medical buildings, while Minnesota Ave boasts a grocery store. For those who do commute to work or school in these neighborhoods, parking is cheap or free, and buses often offer a superior option to rail for those who are traveling between East of the River neighborhoods. But what about the chosen few who do take Metrorail to these 7 stations? In contrast to the system-wide statistics, 63% of trips ending east of the river originated in DC, 28% in Maryland, and 9% in Virginia. The share coming from the suburbs is certain to increase when the federal Department of Homeland Security campus at Saint Elizabeths is completed. Interestingly, 9% of riders traveling East of the River boarded at the Columbia Heights or Georgia Avenue-Petworth stations. Without additional data, one can only hypothesize why so many people (relatively) are making this specific commute. One driver may be the schools. For example, Thurgood Marshall Academy, a high performing public charter high school across the street from the Anacostia metro station, draws students and teachers from all over the city. Perhaps WMATA could release a subset of their data showing trips made with discounted student passes? That would make it possible to further explore this hypothesis.